This book is about hope, love and self awareness. I really enjoyed the story of Murphy and the second chance that he receives to become the man he wants to be. Mr. Handfield’s perseverance in getting his story made into a movie is tremendous. I hope to see the movie soon (YES, Kurt Russell is in it!) and from the movie trailers I see, it looks like the movie follows the book faithfully. Thank you to Don Handfield and Kimberly Kinrade from Novel Publicity for giving me the opportunity to post this guest post and review this novel. Blurb: What came first, Touchback the book or Touchback the film? Touchback began as a screenplay many, many years ago. It was written at a time of great personal turmoil (I was going through the end of my first marriage) and ended up being a breakthrough work for me, as things written in that state of heart usually are. The script got me signed with my first real agent, and was soon optioned by Goal Line Productions, a company owned by the family of football great John Madden, who wanted to produce it independently. I did several passes at improving the script with them, but it never got off the ground. The option expired and the rights reverted back to me. A few years later, Warner Bros. wanted to produce it. We got close, but ultimately they chose to make We Are Marshall instead. About a year after that, Morgan Creek came forward and was enthusiastic about making it with legendary TV director David Nutter at the helm. That, too, fell apart. First, American football movies don’t play well overseas. 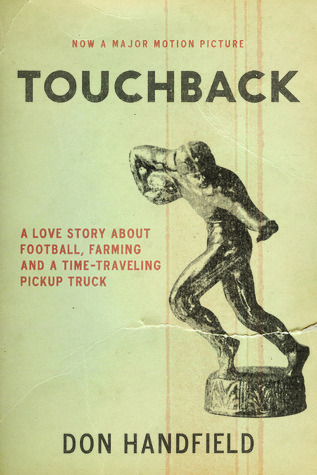 Second, Touchback was, at its core, a Capra-esque love story. These kinds of films don’t get made much in Hollywood these days. The ones that do are based on books with built-in followings, and many of those are written by the same person—Nicholas Sparks. It was this train of thought late one night that led me to Nicholas Sparks’ web site and blog. I had always been a fan of his work, and his personal story behind The Notebook inspired me. I decided that to get Touchback the movie made I would write Touchback the novel, hope it got published, and then pray it became a best seller. Then, they would have to make the film. My plan seems ridiculous now as I write this, but, in a way, it worked. I was 70,000 words into the manuscript when I got a call from the company that ended up financing the movie—Freedom Films. Though I had never shared the novel with anyone at that point, I will always believe the act of writing the book helped to will the movie into existence. So, I put the novel aside and went on to make the movie, but, because I had done so much work on the book, I retained the rights to publish it when I made the film deal. The production rewrite I did on the film before it shot used a lot of elements that weren’t from the original script, but were born in the act of writing the novel. In fact, throughout the process, one informed the other. After the film was completed it was picked up for distribution. When we got our release date of April 13, 2012 I realized I had 70,000 orphaned words collecting cyber dust. It occurred to me that if I didn’t publish the book by the time the movie came out it was never going to happen. United Talent Agency, the company that represents me as a writer and director also represents some of the best authors in the business, including two of my personal favorites—Nicholas Sparks and Wally Lamb. I approached my agents there about helping me find a publisher for Touchback the novel and the response was an enthusiastic yes, we can help you get it published—in two years! So began my crash course in self-publishing. I set to work refining the manuscript, building it out and getting it ready for publication. I was fortunate to find a wonderful editor named Alice Peck to help me get the book into shape. Alice steered me to the team at novelpublicity.com, which has been a great help in navigating the oxymoron that is modern book publishing. It is both an arcane and technologically challenging undertaking, but ultimately liberating. Books are the one artistic medium that can truly be authored. You are the talent, and often the director, the producer, and the distributor (with a little help from Amazon) as well. It’s truly an amazing time to be a writer, and the stories of other self-published authors I’ve come across (from John Locke to James Redfield to Thomas Paine to James Joyce) in the process of pursuing this have been inspiring. After years spent working in film and television, writing books is magical. If I want Bob Costas in my movie, I have to deal with studio executives asking me why I want Bob Costas when I could try for Bob DeNiro to play the sportscaster because he means more overseas. If I manage to clear that hurdle, I have to talk to Bob Costas’ agent, and then if he says no or we can’t afford him, it’s back to the drawing board. It’s a whole involved process that, at the end of the day, may or may not happen. And if I do happen to luck out and get Costas, he might forget his lines, not like me, or any number of other issues could prevent it from working out. And it doesn’t just apply to talent—one is constantly restricted in filmmaking by factors like location, budget, time and other factors beyond your control. If I want Bob Costas in my book, it’s as simple as typing his name. He will always be there, on time, and speak every line I give him without complaint. If I want Bob Costas riding on a gorilla’s back and jumping from a skyscraper on a bungee cord, it’s just a matter of typing it. In a movie, there would be endless meetings, stunt doubles, green screen, and computer generated gorillas…the list goes on and on. Note: Bob Costas is not in Touchback the movie, nor was he ever intended to be. He is however in the book. It’s a bit of a flight of fancy, but you can do that in books. It’s also important to note Bob Costas does not bungee in Touchback and there are no gorillas in the movie or book. And no animals were harmed in the making of either! The whole process gave me so much respect for prose writers. It’s damn difficult work. Despite twenty years of screenwriting experience, ten of that professionally, writing prose is an art unto itself, and something I don’t take lightly. It’s a process I enjoy immensely, but have a long road ahead to master.